The French bank took a 525 million euro first-quarter hit on its Moscow unit. Yet the economic slowdown, weakening rouble, and potential Western sanctions aren’t shaking SocGen’s bullish take on Russia. That may be correct in the long run; right now, it looks too rose-tinted. 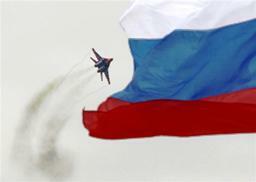 A MiG-29 fighter jet performs a manoeuvre as the Russian national flag flies in the foreground. Societe Generale, the French bank, said on May 7 its net profit in the first quarter of 2014 had declined 13 percent on-year to 315 million euros, after a 525 million euro impairment on the goodwill of its Russian assets. SocGen shares fell 1.4 percent to 43 euros on the morning of May 7.